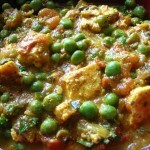 Peas – I got the the frozen Peas. Defrost before using. Heat the oil in a pan and add the cumin seeds + chopped onions + whole garam masala (see above). When the onions turn soft, add ginger garlic paste and saute for few mins. Add turmeric + coriander + chili powder and saute well. Add 1/2 cup boiled water and heat for some time. On a separate pan, heat paneer cubes in butter till it become slight brown and mix it with the above tomato paste. For garnishing, add the fresh cream and coriander leaves.